Haven't designed a logo in a while. This was fun: A martial arts gym for a friend located in Vancouver. The ReBot Gigabyte posters came in on Tuesday, and the first batch of orders were shipped on Wednesday! The poster turned out great! The paper stock was upgraded to 10pt cardstock which is about as thick as bristol board! We will be bringing `under the radar' licensed properties to the poster market. We are confident we can replicate the success of ReBoot posters. Gary Cohen (Editor), John Montenegro (Colourist), Dan Rivera (Colourist), and I are hard at work on finishing the third issue. It's going to be a scorcher of a comic book. I will post the 2 covers soon. Unfortunately, I will not be attending Wizard World Chicago. So to the Crozonia fans from the mid-west, I extremely apologize. Issue 3 will be available to order online at DMF Comics. I will be attending San Diego Comicon International and be a part of the Arcana booth. Crozonia hasn't been exhibited in the West Coast. Issue 3 will premiere at Fan Expo Canada. 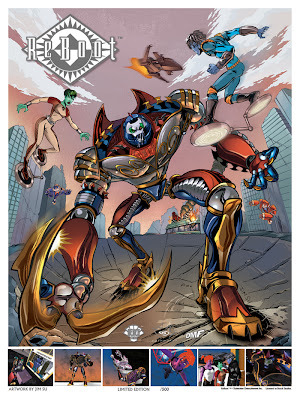 Order The Art of ReBoot at comic book stores NOW! 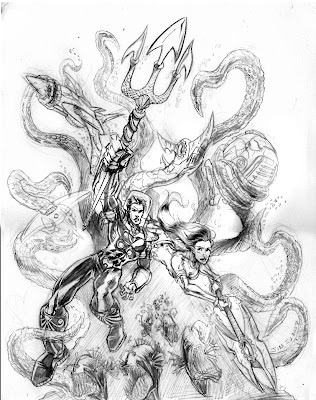 The solicitation for the Art of ReBoot appears in the April edition of the Previews Catalogue. I will scan the page and the order number. The catalogue just came out today, which means we have from now until the end of April to raise as much awareness about the book and get comic book retailers to order it. If you are a fan, PLEASE spread the word. Better yet, go to your local comic book store and order a copy! Arcana Studios is exhibiting at the Emerald City Comicon in Seattle on March 31 -April 1 2007 at Booth #406. DMF Comics/Punch Brand is exhibiting at Sakura Con also in Seattle on April 6-8 at Booth# 130. I will be a guest at the Toronto Comicon on April 13-15 in the Artist Alley. Firehouse Dog premieres April 4th! After The Wild, I worked on Firehouse Dog for Core Digital Pictures for 6 months. I rigged, modeled and animated the CGI stunt dog. During this time I also worked on Silent Hill. I had a great time working on these two movies because the experience was new. For the first six years of my CGI career, I had worked exclusively on CGI toons. Getting to work with live plates, doing tracking work was refreshing. It's one of the main reasons I decided to leave CORE in November to work on Resident Evil 3 for Mr. X. This weekend, Hobbystar hosts the Toronto AnimeCON with various anime guests, UDON Comics, and the ReBoot artbook! Admission is free! This is the first chance for Canadians to pick up the Art of ReBoot! Also, I will be displaying the cover to Crozonia Issue #3! The last few months have been really busy working on the Art of ReBoot. Sean O' Reilly from Arcana Studio scanned over 600 images, Jason Park from DMF Comics and I laid out and designed over 100 pages! This book will be a must-have on every ReBoot fan's list. It will be available at www.rebootart.com in late February 2007, and go into wider distribution over the summer. Jason designed the awesome website. Check it out and sign up on our mailing list!